Grammy-nominated rockers Skillet will embark on a headline tour of the United States this September. The tour will kick off on September 22nd in Clive, IA and through October with more dates to be added and announced in the near future. The tour will feature Thousand Foot Krutch on the first half of the U.S. run and Sick Puppies will finish the second half of the tour. Devour The Day will be playing the entire tour. The headline tour will make stops in cities such as Chicago, IL; Detroit, MI; and Sayreville, NJ to name a few. More tour dates will be announced in the near future. An exclusive presale for The Panheads (The Official Skillet Fan Club) will go live on Wednesday, June 22nd. Tickets and VIP Packages will be available and fans can sign up for the fan club at: http://www.skillet.com/become-a-member. 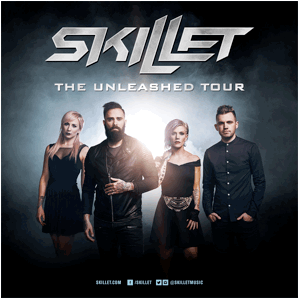 Skillet will be touring in support of their new albumUnleashed, scheduled for release on August 5th. The 12-track album, a year in the making, is currently available for pre-order via all digital retailers including iTunes at: www.smarturl.it/SkilletUnleashed and Amazon.com at: www.smarturl.it/SkilletUnleashed_A. Pre-orders will include an instant download ofthe debut single “Feel Invincible” and the follow-up track “Stars.” A lyric video for “Feel Invincible” can be seen athttps://youtu.be/tmk_cTMqF58 and the official music video will premiere next week. Skillet can also be found on Google Play at: www.smarturl.it/SkilletUnleashed_GP and streaming on Spotify: www.smarturl.it/StreamSkillet.